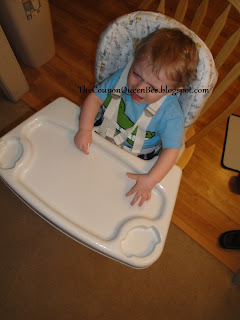 As soon as I had the opportunity to review the MiSwivel feeding chair I jumped on the chance! Feeding chairs to me are the modern solution to a high chair. I find a feeding chair to be more convenient for my family. It allows him to be more apart of the family by being at the same level as us during dinner. Plus in a feeding chair he is more at my level if I pull his chair into the living room to feed him while I am on the couch, (lazy yes but easier sometimes!) We currently have the Fisher Price feeding chair and I found it to be simple and nice but the Mi Swivel is something totally different. This chair was very unique in the way it moves. It can swivel from left to right and titled backwards at different angles and fully forwards to sit upright. The handle that makes the chair move and swivel is easy to use. I was excited to see the 5 point safety harness. Our old chair is only a lap belt and my super wiggle worm is always leaning forward when the tray is off, it worries me he might be able to tilt the chair. At first he was upset that he had to wear a harness but after 3 minutes of singing and dancing for him he calmed down and let me put the tray on. The tray is luxury and thankfully dishwasher safe! It is nice and big to allow room for your little one to have a plate or bowl along with a cup. It fits perfectly on our dining room chairs and he seems to enjoy the big tray to pile up his banana puffs on. The pattern is cute and I am sure in the future there will be more great colors and designs. The clean up on the chair is very easy! The washable cover makes making a mess less stressful knowing I can just toss it in the washer. My hubby thought the chair could maybe not be so white to show food mishaps. Our older feeding chair is tan and red so it allows for less finger prints and messes to be shown. For me as a mom I thought the functionality of the chair was wonderful. This chair is a must for a baby shower. I would have loved to have a chair that can tilt to accommodate feeding a newborn. This chair is designed to grow with your child and can accommodate a 4 year old using it as a booster chair. I definitely look forward to saving money on needing a booster chair since he will have this chair for many more years. My Little Birdie mad about wearing a harness! ** I had cuter pics but they sadly were erased! All I had left was the "Hes mad because he has a harness on him pics". He calmed down after I took off the tray and made him happy again! He does love having his puffs on the big tray every afternoon while mom cleans! * I was not paid for this post. I was sent for free one feeding chair to review. This is my honest opinion and may vary from others. hey there- i have a blog award for you!